Time and time again we are fortunate enough to be a part of one of the best days in someone’s life: their wedding day. Just as it is an extraordinary day for the bride and groom, it is for us as well. From the first reveal to the first dance as Mr & Mrs, Leslie and Matt kept everyone smiling on their big day. Le Méridien Philadelphia was a fabulous spot for this special occasion, and we were more than thrilled to be a part of it! Synergetic Sound + Lighting and Petals Lane were also a part of the magic. We loved spending time with Leslie and Matt in the city to capture their wedding day moments. It was an exciting day for onlookers in Philadelphia too. Hey, it’s not everyday you see a blushing bride and her groom enjoying some Philly wedding fun. 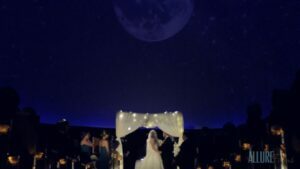 Congrats Leslie and Matt, from the entire Allure Films team!